Can digital advertising ethics change the world? 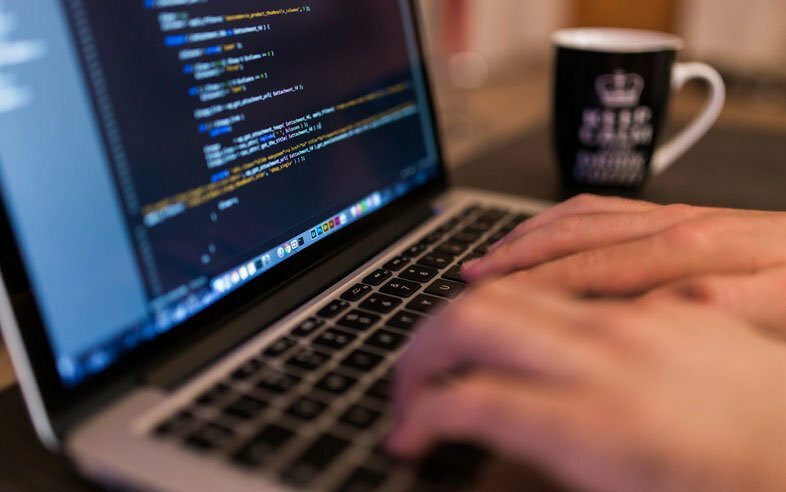 Technological advances, new forms of communication and the rise of social media has consolidated the Internet as a major platform for advertising. This, in turn, has led to the emergence of new formats to create ads on digital media. Therefore, reviewing these new formats and a setting legal and ethical principles becomes the great challenge for all who are dedicated to digital advertising. 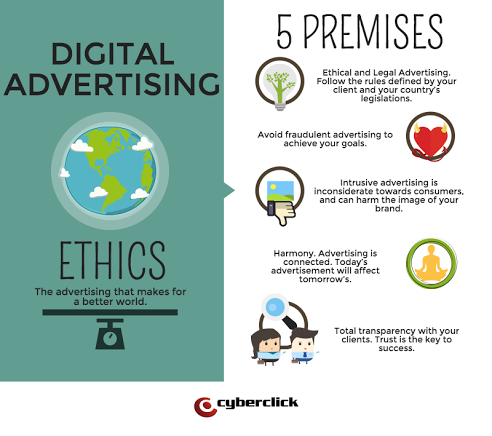 At Cyberclick, we go a step further regarding the definition of digital advertising ethics. It is not just a concept that refers to how we project the advertising we do and what legal, moral and respect we have when it comes to selling products and services, but can also be used to get a better and fairer world. 1# Ethical and Legal Digital Advertising - Assume that all the publicity you make follow the rules set by the customer and complies with the legislation set in the country where the work is performed. This is undoubtedly the key point for online advertising ethics. The marketers did not have to bind only to do the work and achieve results, we must go a step further and try to do the right thing and bring added value to all who see our work. 2# Say no to fraudulent advertising - Another pillar or fundamental rule to ensure that the digital advertising conforms to certain values ​​is to avoid fraudulent messages to achieve the targets promised to the customer. Honesty and transparency are vital. In this sense, it is not worth lying to our customers or using unethical techniques or strategies. On the contrary, we must focus on those formats and messages that add value to the public. Advertising can help achieve a better and more just world if used correctly and honestly. 3# The intrusive advertising does not think about the consumer - Above all, we must think about the user. In this regard, the Digital Ads must avoid being intrusive. That is, advertising, which the user is forced to consume. This is not thinking of the consumer and creates a bad image as it is annoying. We must reject this kind of advertising and go for non-intrusive formats and can add value to users. Intrusive advertising, not only produces a massive rejection in the user, but, ultimately, does not usually give good results. Strive to do things right and get your reward. 4# Harmony. The harmony concept refers to the connection or the butterfly effect produced by an advertising message in another. In advertising, everything is connected. Therefore, an advertisement may impact on others today or tomorrow. Similarly, an advertisement in a specific format may affect another of a different format. Ethics applied to marketing and digital advertising is also closely related to the company philosophy behind their efforts, initiatives, strengths or weaknesses. We must be aware that the stories we create and disseminate as marketers have always influenced the public. This gives us great power we have to use positively reinforcing our social commitment to the people and their welfare. 5# Total transparency with our customers. The relationship between the creative or business marketing and advertising and customer should be as narrow as possible. Trust and transparency must prevail above all. Therefore, it is vital that we move customers all the results obtained by our work with maximum transparency. In this way, we all win. It is no use trying to hide some details or results, we must be honest and 100% integrity with them. In short, now that you know what the Digital Advertising Ethics are and are aware of the 5 keys to your advertising to change the world, it's time to put them into practice in your daily life. Positive results should be linked to ethics in advertising. There is no point doing things without values ​​behind if positive results are not achieved. Hence, the challenge will be finding the formula, with effort and dedication, to advertise under the terms of ethics and at the same time achieving the objectives that leads the customer. We must be aware of the enormous power that as marketers have on public opinion. For this reason, we take care of every aspect of our work and defend our profession doing well. Advertising is everywhere, serving to make something much more important than to sell a product or service. What if we started working to achieve, through advertising, a better and more just world?